Cooking Tips, Food Favorites, Recipes, Restaurants, and More. The best chef knife can’t be defined by a single set of features. It’s all about hand-feel: The knife should comfortably tackle a variety of tasks, functioning as an extension of your forearm. We talked to two chefs, a cooking instructor, and a knife expert, then chopped, diced, and peeled with 11 best-selling chef knives to see which stood out. - The “mighty MAC” was the clear favorite of our testing team — and widely praised by the experts we spoke with. It’s maneuverable enough to chop mint leaves, slice carrots, and peel butternut squash, offering clean cuts without requiring perfect form. It feels comfortable for both large and small hands, and its medium-weight balance means it’s neither too light nor too heavy (we’ll go ahead and call it the Goldilocks of knives). A half-bolster helps you maintain a professional grip, and dimples prevent food from sticking to the sides of the knife as you chop. Retails at $175. - The Shun has a weight and heft similar to the MAC and is versatile enough to handle a range of dicing, slicing and chopping — but only if you treat it right. The knife is covered in an outer layer of Damascus steel, which provides a gorgeous appearance but makes the knife edge more likely to chip if you don’t use proper chopping technique. Like the Mac, the Shun is a half-bolster knife, helping you maintain a professional grip without the added weight of a full bolster. Several of our novice cooks had trouble holding the Shun comfortably, but testers who were already experienced in the kitchen loved its elegant performance. The Shun is slightly more expensive than the MAC, retailing at $182, and a good pick for those who’ve mastered the basics. 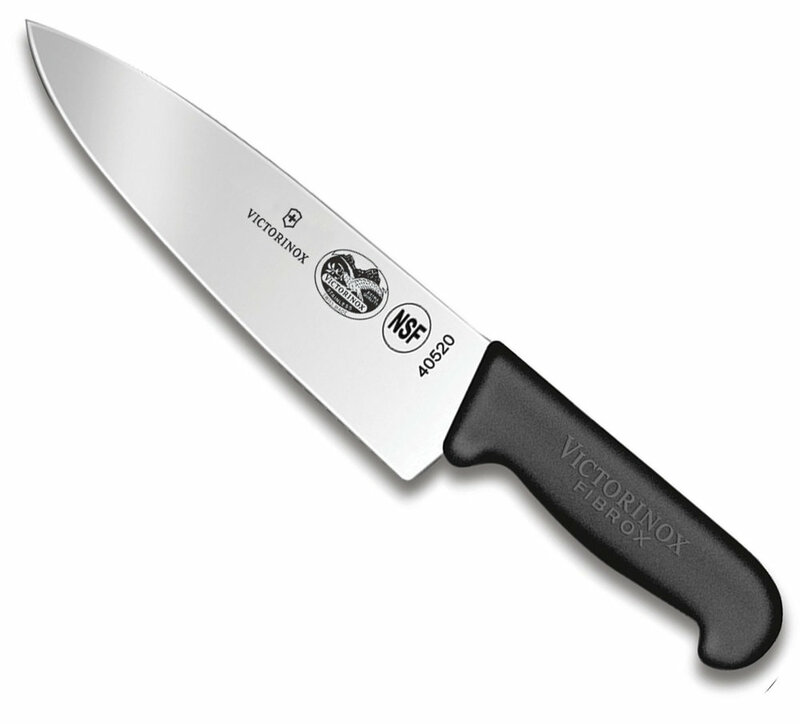 - If you want a quality knife but don’t have a lot of money to invest, the Victorinox is our pick, retailing for around $45. While half an ounce lighter than both the MAC and the Shun, the Victorinox is large — wide blade, wide no-slip plastic handle — and designed to take on big jobs. (Think large cuts of beef, not chicken tenders.) Our testers found it comfortable and easy to use even when chopping herbs, but noticeably bulky compared to the Shun and MAC. The Victorinox’s price point also means the blade might not hold an edge as long as a more high-end knife. If you’re just beginning to explore the world of fancy kitchen equipment, consider it a test run: try it for a few months, and if you find yourself using it all the time, think about upgrading to the MAC or the Shun. Chef knives are versatile, but you’ll still need a few specialty knives. Don’t forget to keep your chef knife properly sharpened! Also, Honing and sharpening are not the same. Lastly, avoid the dishwasher at all costs. For those who may not know this yet, I have launched a long awaited Spice Company called Spicy Rooster (not spicy by the way just the name is spicy :-) I have started with five amazing blends that are all organic, non-gmo, and gluten free. For recipes and more please stop by the Spicy Rooster website, www.SpicyRooster.com. Thank You! P.S. I will be adding more recipes here too, so come back soon! This fall favorite never tasted so good. The simple step of roasting your butternut squash first adds an added layer of richness to this already flavorful soup. Preheat oven to 375°. Take Butternut squash and chopped onion and toss with olive oil and a pinch of salt and black pepper. Roast until golden brown, approx. 20 minutes. Place all remaining ingredients in sauce pan and bring to a slow boil. Blend ingredients together using emulsion blender (aka stick blender, if you don’t have one a regular blender will do the trick although you might need to do it in 2 batches). (If you want a creamier version and don’t mind the added calories use 3 cups of chicken stock and 3 cups of heavy cream). Whether the hipster trend is here to stay or not only time will tell. Also, whether you associate yourself with said trend or not is up to you. That being said you may be pro-hipster or you may feel that all hipsters should be banished to their own island where they are forced to live without cuffed skinny jeans, cold-brew coffee, and Pabst Blue Ribbon. But wherever you fall on the hipster love/hate scale, there is no need to throw the hipster out with the bath water, or in their case, there is no need to throw the hipster out with the Kombucha. Now don’t take my subtle (or not so subtle) Hipster jabs as hipster hatred, not at all. Although I am not a hipster, nor do I plan on becoming one, I think there are many cool, oh wait… I am dating myself because cool is so 80’s, let me hipsterize that… there are many ‘deck’ food contributions that the hipsters bring to the table. (Yes, that was a food pun, get used to them there are more coming). Hipsters love food and therefore they take their noshes very seriously. They like artisanal offerings and local produce, they seek out hand crafted and organic foods, simply put they are locavorists (ok maybe that was not so simply put). Sure, they may be a little snobbish if you don’t feel the same way about their food ethics, but we still love you hipsters. Food Trucks – These portable gems were once called roach coaches or gut trucks. But, with the hipster’s social media power, they have re-fueled (see what I did there) these trucks popularity. Now, whether you want Kimchi Tacos or Kogi BBQ, these mobile meals or worth checking out when they come to your area. Pickles – Who knew the pickle needed a makeover? Gone are the days of only having sweet or dill pickles on the shelf, now the pickle comes in flavors like habanero horseradish dill and moonshine, (both of which are actually pretty tasty), but call me old fashion, I still gravitate towards a traditional pickle. Kale – This leafy cabbage, is a cross between lettuce, spinach and cabbage and it is everywhere! It’s on every salad menu, it at every juice bar (another hipster fav) and it is in almost every smoothie! There are kale chips, and kale has even tainted our beloved ice cream, I'm good with kale in a salad or in a smoothie (if I really drank smoothies) but in my ice cream, "Ok,easy does it hipsters you are pushing it with kale ice cream. The Gourmet Burger – Ok Hipsters, now were friends again. I love a good burger and some of the specialty hipster inspired burgers out there are simply delicious. Granted not everybody wants caramelized onions and pork belly on their hamburger, but there are some tasty combinations worth trying. Whether you want to keep your experimentation simple and only add some garlic aioli to your next burger or maybe you are all in and will go full boar with a custom blend of ground prime rib, brisket, skirt steak and tenderloin, topped with Nueske’s bacon and Cowgirl Creamery’s triple-cream Mt. Tam cheese. Either way, branch out and try some unusual burgers, you may even like it. Vegan – Now if you are not one of the meat loving Hipsters, like above, then you likely are one of the growing Hipster Vegans. Perhaps this has become so popular with many hipsters because it goes against the mainstream, another hipster value. Now, I have tried a few vegan restaurants and I’ll be honest, i wouldn't go their often but places like Veggie Grill are worth trying once in a while, especially if your in the mood for "chicken", tempeh or a Quinoa burger. Kombucha – Although not really my cup of tea (see there’s one of those food puns again, sorry I can’t help myself) this fizzy fermented bacterial concoction does come with some heath benefits and if you like fizzy tea there are a few flavors, like Chai and blood orange, even I can drink once in a while. So where does all this hipster food talk leave us? Well, you don’t have to wear a man bun and sport some Zappa facial hair, and if your a girl you don’t have to wear fake glasses and don a jeans skirts and oxford shoes to enjoy some of these Hipster favorites. My recommendation, live a little, take a few food risks, eat outside your comfort zone every once and a while and unashamedly feed your inner hipster! There is nothing like a simple tomato sauce and pasta. The smooth texture and unassuming flavor of a perfect Pomodoro are hard to beat. Perhaps it is my Italian bias, but the first time I tried a Pomodoro sauce in Italy my first thought was, "This is Amazing!" My second thought was, "How can I recreate this?" So, after a little trial and error, I give you this simple yet satisfying sauce. Heat extra-virgin olive oil in a large skillet over medium heat. Add finely minced onion and cook, stirring, until soft 10-12minutes. Add garlic and cook for an additional 3 minutes. Add crushed red pepper flakes; cook for 1 minute more. Increase heat to medium, add puréed tomatoes and season lightly with kosher salt; cook, stirring occasionally, for about 20 minutes. Cook Spaghetti al dente (approx. 8-9 minutes). Drain, saving 1 cup of pasta water. Don't rinse pasta. Add pasta water 1/4 Cup at a time, only as needed to loosen sauce. Toss with pasta and fresh chopped basil, finish with grated cheese and Bon Appetite! Quick and Easy Cinco De Mayo Tacos! Let’s start with a bit of history. What is Cinco de Mayo (apart from the literal meaning, the fifth of May)? Simply, it is a celebration of the Mexican victory over the French army at the Battle of Puebla on May 5, 1862. This is not to be confused with Mexico’s Independence Day, that is September 16th. Cinco de Mayo was made a national holiday by Mexican President Benito Juarez and today it has become a popular day to enjoy some Mexican cuisine, and who doesn’t like Mexican food! So, here are a few quick, easy, and healthy Cinco de Mayo recipes. Put all ingredients in a food processor and pulse until combined. DONE...Super simple! Corn Tortillas --- (My preference is to get these from a local restaurant that makes them daily, but when that is not an option check out Trader Joe's they have a few decent options. This is one place where spending a little extra goes a long way in making killer Taco's so try and find something fresh). Prep: Halve your Avocados de-pit and cut into cubes, and scoop out. While browning turkey meat add taco seasoning. Stir over med high heat until cooked through, about 5 minutes. Set aside. Take your fresh tortillas and warm or even better place over flame and give them a nice light char. Finish with some fresh chips (Chica's are my favorite), and enjoy! One of the things I enjoy most about being a Chef is discovering delicious restaurants and finding tasty products, so, with that in mind, I figured it was time for me to share a few new favorite food finds. Although some of these products may not be available in your local store, you can order them online. 7. Crown Bourbon Barrel Aged Maple Syrup – Hands down the best maple syrup I have ever tasted. They have several other flavors which are also quite good, but this flavor is unbelievable. A little hard to find in stores, you will likely have to go online to get this gem, but it is well worth the google search. 5. Kind Fruit Bar – These fruit bars are not sold in stores yet, I had the opportunity to try these at a food expo, and let me just say this, when they finally hit the shelves I will always have several of these bars within reach as a healthy snack option. The Apple-Cherry Bar was crazy good! They almost make me want to eat healthy every day! 4. PopChips with Ridges – Who knew ridges can add so much… well apparently PopChips knows. For all those potato chip lovers out there, and really who doesn't like a good chip every once in a while, but for those of us occasionally want a chip without the calories and fat, there are these. I have found PopChips to be a decent substitute, but honestly they do not always give me that “this is just like a potato chip” feeling. Well, PopChips with ridges makes you feel like you are eating a “normal” potato chip, flavor and all. These chips are amazing. These things are addictive, so be ready to eat the whole bag, but wait… they are healthier than regular chips, so now you won't feel the guilt when you find you have just finished the whole bag! (These are a NEW product so you may need to go to PopChips website to see where you can buy them). 3. Golden Island Korean BBQ Pork Jerky – Although not quite as tender as some of the jerky out there, the flavor far outweighs its normal jerky texture. A great protein snack! I have found this product at several Costco’s and it is also available online. Simply delicious jerky. Thanks for stopping by and I hope you enjoy some of these super duper food finds! Rocky Balboa may be Philadelphia's most celebrated fighter, but this city's greatest fight is between two South Philly cheese-steak eateries : Pat's and Geno's. Lots of places have signature foods: Chicago has deep-dish pizza, New England has clam chowder, Buffalo, N.Y., has hot wings, Maryland has crab cakes and New Orleans has gumbo. But in Philadelphia, the cheese steak reigns supreme! This finger-licking good iconic obsession isn't hard to replicate with a few simple ingredients and the right preparation your home made creation could make your sandwich a contender. Spread butter on both sides of your Hoagie roll and brown on griddle or pan. Take off the heat when brown and keep handy. Add you onion and carmelize. When the onion becomes translucent add salt and sugar cook until brown. Put aside. Take your frozen sliced ribeye (use fresh if you can't find frozen and ask your butcher to throw it on a deli slicer for you, unless you actually have one of your own) and cook it on a griddle with just a dash of canola oil. While cooking use your spatula to break apart the meat as it cooks and add your pinch of salt and pepper. Cook both sides for approx 2-3 minutes. Place the ribeye on your tasted roll, add your cheese top with your onions, let sit for a minute to melt cheese and dig in! For an added layer of depth brush horseradish cream sauce to the roll before layering. This thing is delicious and what you save on airfare to fly to Philly you can make about 50 of these sandwiches. Valentines Day is a busy day in the restaurant biz, and one that often forces many restaurants to streamline their menu offerings to a preset list of options with only a few variants, and even though the whole “night out” is a great idea, you and your special someone might want to avoid the crowd and enjoy a cozy candlelight dinner away from the hustle and bustle of this Hallmark Holiday. Keeping in mind that spending all day in the kitchen might kill that loving feeling, here is an easy and elegant option for a divine dinner for two. This simple dish doesn’t require much work, making it perfect for your romantic dinner. Transfer to sheet pan and finish in the 350 ° oven, approx. 10 minutes. Now, add your sliced tomatoes to the already hot sauté pan, cut side down. Sprinkle with salt and fresh ground pepper and 1/4t fresh thyme. Cook this way for 1-2 minutes then add 1 clove fresh peeled garlic (sliced). Lightly brown garlic then add 1/4C white wine (substitute chicken broth if desired), reduce and finish with 1T butter. You can add fresh asparagus tossed with olive oil salt and pepper to the oven with the fish for an added veggie or steam a side a jasmine brown rice. Pick up a few chocolate covered strawberries for dessert and VIOLA, simple, elegant dinner for two without the crowds. You don’t need to attend Le Cordon Blue to cook like a trained chef. All you need to cook like a pro is a little bit of knowledge, a few kitchen essentials, and practice. Below are ten tools, tips and tricks of the trade that will go along way in helping you serve up some chef-like food. #1 The Knife: Every Chef knows the value of the right equipment and a quality knife is the single most important kitchen tool. There are many high-end knives that you can buy if you are willing and able to fork out the cash, but if you do not want to spend $150+ there is an exceptional option that is available for under $50 and it is the Victorinox 8’ Chef knife. Pro’s and foodies agree, this is a knife that should be in your collection. #2 The Temperature. Buy an oven thermometer (and a meat thermometer while your at it). Spend the $6 and invest in this essential gadget. Why is this a must have for every kitchen (even a professional kitchen). Every oven is different, they heat differently and even though you may turn the dial to 350° your oven may only be 300° or it may be 390° by the time it has finished its preheating. So if you are wondering why some of your baking doesn’t turn out “just right” oven temperature may be the cause. #3 Stick with it! The final tool I will mention in this article is the Immersion (aka Stick) Blender. This is one of my favorite kitchen tools and a must have if you want to make your soups velvety smooth. A great tool for also making salsa, homemade mayo, smoothies, pesto, and with a few pulses you can make that Bolognese just like the one you had in Italy. It is easy to use, quick to clean, and not as messy as a blender. #4 Check the Date. Spices typically last three to four years. So, if you are wondering why your Curry Chicken tastes like bland hospital food and not that exotic mouth watering recipe you dared to try for that dinner party, it may very well be because your spices are outdated and out of flavor. When you buy new spices make sure to date them so you will be better able to keep track of their shelf life. If you want to season with confidence check the date of your spices TODAY. #5 Prep like a Pro. Every restaurant puts in the time to do the prep work before a pan is placed on a burner and before a protein is laid on the grill. Read the entire recipe from start to finish before you begin. Make sure you have everything you need and then do the work and prepare your ingredients before you start cooking. There is nothing worse than scrambling to chop an onion while the garlic burns on the stove, this can ruin a dish, it is an opportunity to be careless and cut yourself, and it can generally make the whole cooking experience rather stressful. Take my advice and prep like the pros and your cooking will be easier and more enjoyable. #6 Keep it Fresh. The importance of fresh ingredients cannot be overstated. The fresher the better when it comes to cooking. One way to keep it fresh is to cook with seasonal products. If you cook with what is in season you will not only save yourself a little money, but you wont have to do as much to your food in order to bring out the fullness of their flavors. #8 Take a Bath! When vegetables take the sad turn from bright green to dingy dull you can be left emotionally sagging like your veggies. The reason for lifeless looking veggies is usually due to overcooking or soaking them too long in acidic dressings. So, if you want to keep the green in your green beans (and other veggies) then cook, drain, and serve right away (cook green veggies for no more than 7 minutes). If you won’t be eating those delicious greens right away then just give them an ice bath (aka blanching or shocking). Cook for about two minutes in boiling water, remove and dunk them into an ice bath. This will stop the cooking process and help those veggies stay bright and green. Vegetables can be quickly reheated and remain green by sautéing in hot pan. Also, when dressing veggies in a vinaigrette, wait until a few minutes before serving to dress them, that way they will keep their vibrant color. #9 Clean as you Go! If you’re like me there is nothing worse than finishing the hard work of cooking for friends and family only to see a pile of dirty pots and pans piled high. The answer is to clean as you go. Simply fill the sink with warm, soapy water, and as you finish with that pan, slide it into the water and let it sit for a few minutes. Come back in between cooking items and everything will usually wipe off easily, Finish with a quick hand washing and the worst part of cooking (the cleanup) just became a whole lot easier. #10 Taste as you go! I saved the best for last. This is one of the most overlooked, yet most important aspects of home cooking. For you chefs out there this is second nature, but for you weekend foodie warriors’ overlooking this step is the fastest way to serve up unsavory and unappealing food. Recipes do not always have the right proportions; so use your palate as your guide and taste as you go. You would be surprised at the difference an extra pinch of salt or an additional dash of pepper can make. Stay tuned for another article coming soon on Kitchen shortcuts and ingenious tips for cooking at home. The BEST Fettuccine Alfredo EVER! All too often Fettuccine Alfredo is a horrible looking pile of pasta that vaguely resembles a fifth grade paper-mache project gone very very wrong! When eating fettuccine alfredo out you will either receive a steaming mess of overcooked pasta sitting in a flavorless puddle of cream juice, or you will encounter a pasty glop of spackle. But it doesn’t have to be that way, I am here it give you a better way to enjoy this dish, and when it is done right fettuccine Alfredo is an extraordinary taste-bud experience. And when you see how simple it is to do-it-yourself you will never play Fettuccine Alfredo roulette again. The BEST Chicken Fettuccine Alfredo Ever! Sauce: Add Olive Oil to hot pan, sauté chopped garlic and shallots until lightly brown, add white wine and reduce for @ 1 minute (until half of the wine has been cooked off), add cream and salt and pepper, reduce @ 2-3 minutes add Pecorino and butter and simmer for another minute until desired thickness is reached. Toss pasta in sauce and top with chicken. A great way to get a little green in the dish is to add steamed broccoli or peas. Finish with rough chopped parsley and shaved Pecorino Romano and enjoy the best fettuccine alfredo you have ever had! Don’t forget to SUBSCRIBE to MikeLutz.org and get all my latest recipes and other updates! Great food is not that difficult to make. I know the thought of making restaurant style food at home can seem impossible, and a bit intimidating, but it shouldn’t be. Do not let that one time you tried to recreate that incredible meal from your favorite restaurant, but you wound up eating some bizarre flavorless variation of what you set out to make, stop you from enjoying great food. Have no fear, I am here to help you make great food! A key to creating great looking meals and even better tasting cuisine begins by using fresh ingredients. The fresher the better! From steaks to seafood, produce to poultry, the fresher the better. Another tip that I learned early on in my restaurant career is the importance of seasoning. If you are making something with multiple layers season each part individually. That way when everything comes together the flavor with be even more delicious. Add 1 1/2 C water, 1 Can coconut milk, 1t salt and rice. Bring to boil. Cover, simmer until fluffy. Finish with salt and fresh pepper. Greens – After cleaning greens rough chop and sauté in hot pan with olive oil and minced fresh garlic. As garlic begins to brown add pinch of salt and pat of butter. Toss remove from heat. Above Photo by Pinch of Yum. In the ten plus years I spent in the restaurant business as a chef, sauté dishes are by far the most fun to prepare and the most flavorful. Chicken Piccata is one of my all time favorite chicken dishes. It is easy to make and hard to mess up, making it a great place to begin your sauté practice. Prep: Dice Shallots, flour chicken, Cook pasta al dente (approx. 6 minutes for cappellini), have all ingredients out and ready. Production: Heat sauté pan on high flame. Add oil, let oil heat up before adding chicken. Add floured chicken and brown both sides. Add shallots sauté until golden brown, deglaze with lemon juice for @ 30 seconds, add wine, reduce another 30 seconds, add chicken stock, capers, salt, pepper and butter. Simmer. Remove chicken from pan, toss pasta with sauce, and serve! This is sure to be a new family favorite. Well, if you are like me, then it doesn't quite feel like fall with temperatures in Southern California still in the 80's and 90's, but that won't stop me from starting to enjoy some of my fall favorites. At the top on my list for fall favorites are soups. A good hearty soup is a great starter or even better meal when accompanied with fresh baked bread. One of my favorite soups is Black Bean soup. It is a hearty and versatile soup that is super easy to make. The process is simple, give all your vegetables a rough chop and sauté in 3 T of Olive oil for 4/5 minutes (keeping your cilantro out for later). Add your black beans and vegetable broth (you can use chicken broth if you prefer), make sure you completely cover all the ingredients by an inch. Bring to a boil then turn down and simmer on low until beans are tender @ 2 hours (again if you use canned beans than all you need is about 30 minutes for vegetable to soften). Add the remaining ingredients (spices) holing back one bunch of cilantro and sour cream for garnishing. Preferred Method: (I love the texture when it is blended, if you don't then you will need to chop your vegetable to a desired eating size). Take a stick blender and puree all ingredients. This is where you can add more liquid if you find it is too thick. Also, after everything is blended, taste and add more spice if you like. (Tasting as you cook is essential to everything coming out just right, never take a recipe at face value without tasting as you go). Enjoy! More soups to come. A Grilled Chicken Caesar Salad, with a zesty dressing and flavorful croutons, is my favorite salad, but a close second goes to the BBQ Chicken Salad. Most restaurants now days seem to have their own variation of this popular salad. Here is my take on it. SUBSTITUTION: If you want to save time then you can use a bottled Ranch. Recommendations Kens (Several Varieties), Hidden Valley Ranch Original, Kraft. 1/4 cup good-quality sweet-&-spicy (Recommendations: Trader Joes Bold and Smokey, Stubbs Original, my favorite NOH Hawaiian. Grill Chicken and finish brushing with BBQ sauce. For the restaurant look, place items in sections on top pf salad (like in picture) Drizzle Ranch dressing and fresh BBQ sauce on top, top with grilled sliced chicken and finish with tortilla strips. Today I am going to deviate from my own recipe's to share with you a great twist on the traditional chicken casserole. My wife made this dish the other night, and being a big rice and noodle fan myself, I have to say I didn't miss either at all in this quinoa based casserole. The two twists she made on this Cooking Light recipe was to bake the chicken first separately and then bake it in the casserole and she did not include the mayo to save on calories. Either way works great. 1. Heat a medium saucepan over medium-high heat. Add 1 1/2 teaspoons oil; swirl to coat. Add quinoa; cook 2 minutes or until toasted, stirring frequently. Add 1 1/4 cups water; bring to a boil. Cover, reduce heat, and simmer 15 minutes or until quinoa is tender. Remove from heat; let stand 5 minutes. Fluff with a fork. 3. Cook broccoli in microwave according to package directions, reducing cook time to 2 1/2 minutes. 4. Heat a Dutch oven over medium-high heat. Coat pan with cooking spray. Add chicken to pan; sprinkle with 1/8 teaspoon salt and 1/8 teaspoon pepper. Cook 5 minutes or until browned, turning occasionally; remove from pan. 5. Add remaining 1 tablespoon oil to pan; swirl to coat. Add onion and garlic; sauté 5 minutes. Combine milk and flour, stirring with a whisk. Add milk mixture, stock, remaining 3/8 teaspoon salt, and remaining 3/8 teaspoon pepper to pan. Bring to a boil, stirring frequently; cook 2 minutes or until thickened. Remove from heat; cool slightly. Add Parmesan, stirring until cheese melts. Stir in quinoa, broccoli, chicken, and mayonnaise. Spoon mixture into a 2-quart glass or ceramic baking dish coated with cooking spray. Sprinkle with cheddar. Bake at 400° for 15 minutes or until casserole is bubbly and cheese melts. Summertime is not usually soup-time, especially if you are experiencing those summertime high temps, but there are still some incredible soup options that make great summer eats. Gazpacho soup is one such meal. All you need to do is to sharpen your knife skills and do a little slicing and dicing and you will have a healthy and tasty meal in minutes. 2-3 Cucumbers, 6-8 Tomatoes, 1 Red Onion, 1 Red Pepper, 1Pt Tomato Juice, I/4 BunchCilantro, 1/4 Bunch Italian Parsley, Salt, Pepper, Red Wine Vinegar, Tobasco, Olive Oil, and Worcestershire Sauce. De-seed Cucumbers and Tomatoes and dice in small cubes. Dice Red Onion, Red Pepper, Cilantro and Parsley. Put in Bowl and pour enough Tomato juice to cover ingredients. Add 2 T Olive Oil, 2T Worc. Sauce, 1/4 cup red wine vinegar, a few dashes of Tobacco, Salt and Pepper to taste. This is such a versatile soup you can add more or less of just about anything and you won't sacrifice on taste. For a great finish to this soup add Cooked Shrimp and Diced Avocado! One of my favorite foods is a Fish Taco. Having tried many different versions, I have come up with my take on the this west coast classic. There is one simple key to making a killer Fish Taco, FRESH is BEST. Keep it simple and keep it fresh and you can't go wrong. Fresh Tortillas are important here too, so find a local Mexican restaurant near you that makes tortillas daily (or make them yourself if your up to it). If this is not an option I have found that Trader Joe's has a handmade corn tortilla that is a good second choice. Next, a freshly made simple salsa is important. (No Quantities given here, make it to your personal taste, some people like more garlic, some like less, some want more heat, some want less etc.) All that is important here is add ingredients slowly building the flavor profile to taste. Basic Fresh Salsa: Tomato, Garlic, Red Onion, Lime Juice, Olive Oil, Cilantro, Jalapeno, Salt Pepper. Top with Shredded Cabbage, Fresh Salsa, finish with a squeeze of lime, and you have a healthy (not fried) fish taco that is on par with anything you can buy in a restaurant. You can mix this recipe up a little by making a corn salsa or mango salsa. If you like those Baja spreads you can make a quick version with Mayo, Chipotles, lemon juice, and Garlic (blend together and you are good to go). Whether it is the weekend get-together or the more formal wedding reception, baby shower, or birthday party, are you looking for something different than ordinary soda and water beverage options? If so here are two very tasty, quick and easy refreshing summer drink choices. *This recipe is easy to modify if you don't want mint, if you want it sweeter or with less sugar, or even add a little more water to thin it out. Bring 1 cup water to a boil in a small saucepan. Pour syrup into the pitcher, add 4 cups water. Serve limeade with lime slices. **Nice change is to use sub the 4 cups of still water with Seltzer water!